THERE may have only been five games in the Camden Sunday League this weekend but fans were still treated to a mouthwatering feast as an impressive 41 goals were scored at Hackney Marshes. Treble-chasers Reddot moved to within five points of Division One leaders Cobden Athletic following their convincing 6-2 victory over Tergemo. Paul Reid fired the Dots into a commanding lead when he bagged a brace within the opening 25 minutes of the game. Micky Dowsett all but sealed the points when he added a third from the penalty spot before the break. The goals kept on coming in the second-half when John Donovan rounded the keeper and slotted the ball into an empty net to increase Reddot’s uncatchable lead. Tergemo were rewarded for their battling spirit with two well-taken goals. But the result was never in doubt with Jason Medford and man of the match Martin Ray both adding their names to the score sheet to complete the rout. The only other top flight fixture saw Archway Allstars clinch a thrilling 3-2 victory over AFC Brasenose thanks to a delightful double from Terry O’Neill and a strike from Leigh Hartley. The only game in Division Two saw league leaders DOM stretch their lead at the top of the table to 14 points with a 4-2 victory over Surreal Madrid. 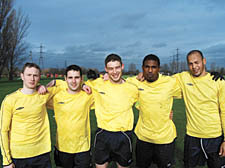 The result of the weekend came in Division Three where AFC Shooters netted a resounding 17-0 win over Tevekkeli. The clinical shooters have now scored 54 goals in just eight games, leaving them three points behind the league leaders AC Scorpions with two games in hand. Elsewhere the Surreal Madrid ‘D’ team beat Desportivo 4-1 to clinch only their second win of the season. Division One high-flyers Phoenix sealed their place in the quarter-finals of the London Junior Cup with a nail-biting 2-1 victory over Dee’s Reserves. Mark “Munchie” Doyle opened the scoring midway through the first-half before turning provider to set up James Cole for his 18th goal of the season. The Constitution also booked their place in the last eight of the prestigious competition with a 3-0 win over league rivals Hornsey. Billy Evans fired the Cons into an early lead before Reuben Malcom made it 2-0 when he latched on to a throw in from brother Darrol to slot home from close range. Hornsey tried to fight back but goalkeeper Connor Colman and the woodwork preserved the Con’s clean sheet. Evans sealed the victory late on with his second of the game.